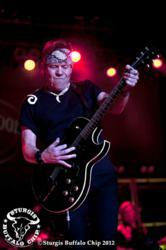 George Thorogood & The Destroyers first to perform on HD Net as part of the Sturgis Buffalo Chip concert series. Gorge Thorogood rocked the capacity crowed at the Sturgis Buffalo Chip during the famed Sturgis Motorcycle Rally. Rod Woodruff, president of The Legendary Sturgis Buffalo Chip, today announced the premiere broadcast dates for four live concert performances recorded in high definition during the 2011 Sturgis Motorcycle Rally, the Sturgis concert series at the Sturgis Buffalo Chip. The shows will be broadcast in high definition on HDNet. The first, the LIVE concert performance of George Thorogood & The Destroyers, is scheduled for broadcast on Sunday, March 4th at 8:00pm. The other three live concerts are scheduled for the following three Sundays in March. Thorogood helped celebrate the Chip’s 30th anniversary by performing all of his hits, including “Bad to the Bone”, “I Drink Alone” and instant classics from his latest album 2120 Michigan Avenue. “George is one of rock ‘n rolls greatest live performers. Put him in front of thousands of roaring motorcycles, tens of thousands of his biggest fans, add a few cold beers and, well, it’s just the best party anywhere”, explains executive producer Rod Woodruff, also the Sturgis Buffalo Chip’s President and CEO. Other shows will feature concerts by Gregg Allman, Jeff Bridges and Stevie Nicks, and John Fogerty, acts who joined the 2011 concert lineup that included Def Leppard, Toby Keith, Poison, Alice Cooper and dozens more. The Buffalo Chip’s annual music festival has already announced The Zac Brown Band, Boston and Sugarland as part of its 2012 musical lineup. More information is available at http://www.buffalochip.com or at 605.347.9000. HDNet (http://www.hd.net) is the independent network with unique and thought-provoking content that appeals to men of all ages and is delivered in true high definition. Launched in 2001 by Mark Cuban and General Manager Philip Garvin, the HDNet networks are available in the U.S. via AT&T U-verse (Ch 1105), Charter, Comcast, DIRECTV (Ch 306), DISH Network (Ch 9422), Insight, Suddenlink and Verizon FiOS. NATURAL 9 ENTERTAINMENT, based in Burbank, CA is led by Carol Sherman and Jeff Androsky who are Co-Executive Producers for the HDnet series. They are also Executive Producers of: “New Years Eve LIVE!” and “Robbie Knievel LIVE!” for FOX BROAD-CASTING, “STURGIS: All Access” and “The World’s Greatest Casino’s” for THE TRAVEL CHANNEL, “Reality Remix” and “The Really Awards” for THE FOX REALITY CHANNEL, “Victoria’s Secret: Angels Across America” and “Bootcamp” for VH1, “Unmasked” and “Elle Macpherson Swimsuit Edition” for NBC, “It’s a Miracle” for PAX, “The Champions of Magic” and “Making of a Model” for ABC.